According to the M.A. 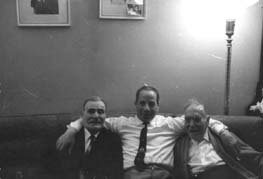 thesis of Albert Adatto, a student of University of Washington in 1939, (“Sephardim and the Seattle Sephardic Community”), the first two Sephardic Jews Jack Policar (d. 1961) and Solomo Calvo (d. 1964), arrived in Seattle from the island of Marmara, Turkey in 1902. The first Turkish Jew to arrive in Seattle is thought to have been David Levy in 1900. In 1904, they met Nissim Alhadeff, who had arrived that year from the Isle of Rhodes, between Greece and Turkey, in a Seattle Greek Café. In addition to Marmara and Rhodes, Sephardim from Tekirdag (Rodosto) and Istanbul (Constantinople) joined the first Turkish Jews immigrant group. Almost all were young men, and after a few years some went back to their homes in Turkey to marry and bring their new wives to Seattle. Shortly thereafter the first of the American-born Sephardim appeared. By 1906, 17 Sephardic Jews resided in Seattle. That number tripled by 1907. As economic and political conditions in the Ottoman Empire deteriorated, and as Jews became newly subject to the draft, immigration increased. Sephardim from Constantinople and Rodosto joined those from Rhodes and Marmara. By 1910 there were about 40 Sephardic families, more than 100 souls, and growing. By 1916 the Sephardic community had grown to about 1500 people, which comprised three separate groups, Sephardic Bikur Holim, the Rhodes group which established their own synagogue, Ezra Bessaroth and the Marmara group. Sephardic Bikur Cholim, founded by Jews from Turkey, particularly Tekirdag, incorporated in 1910. The congregation purchased the former Ashkenazic Bikur Cholim synagogue on 13th Avenue and Washington Street. To this day Sephardic Bikur Holim follows the traditions and customs brought from Turkey by its founders. 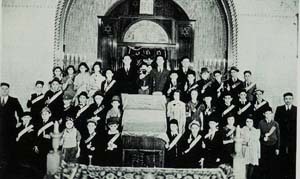 Ezra Bessaroth Congregation evolved out of Koupa Ozer Dalim Anshe Rhodes, a fund to help the needy in Rhodes; its synagogue incorporated in 1914. Ahavath Achim Congregation, founded in 1914, had a membership that included the earliest founders of the Seattle Sephardic community -- Jacob Policar, Solomo Calvo, and David Levy. According to the Seattle Sephardic Bikur Holim website, up to 1908, Jewish religious services such as for Rosh Hashanah and Yom Kippur had been held by all of the Sephardim together, in a rented hall, with the Ashkenazic rabbi coming over to blow the shofar. In the following years, because of differences in minhagim, the Turkish (Tekirdag and Marmara) and Rhodes groups were determined to conduct their own separate religious services. In 1911, Samuel Morhaime, head of the mutual aid society of the Tekirdag group, decided to purchase a Sefer Torah, a handwritten copy of the Torah, from Palestine, as the first step towards a synagogue. Two years later, the Tekirdag group took action towards the establishment of a synagogue. The Ashkenazi synagogue, Bikur Cholim, was completing the construction of a new building at 17th and Yesler, so their old synagogue, at 13th and Washington, was becoming available. The Tekirdag group called a meeting, and their leaders convinced them to take joint and dramatic action. They raised $800 and agreed to buy the building, along with a section of cemetery, from Bikur Cholim. The synagogue was established as Bikur Holim, named after the synagogue in Tekirdag, and Joseph Caston was elected as its first President. Officially, it was known as the Spanish Hebrew Society and Congregation Bikur Holim. At this time, the Marmara group decided to maintain their own identity. Religious services at Sephardic Bikur Holim were conducted by Rabbi Shelomo Azose, who had arrived in Seattle 1910 and had served as a haham in both Tekirdag and Marmara previously. According to Adatto’s master thesis, Rabbi Solomon Azose served as schohet (ritual slaughterer), cantor, and mohel (one who performs circumcisions) until his death in 1919. When he passed away in 1919 he was succeeded by his brother, Rabbi Isaac Azose, who served until 1924. After World War I was over, a number of the relatives of the Sephardim living in Seattle, who had suffered through the war in Turkey, made their way to the US to be with their family members. 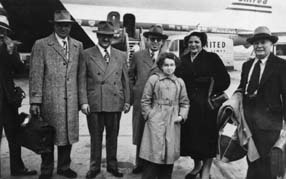 This influx lead to a sudden increase in the Sephardic population in Seattle, but it was followed by a number of families leaving Seattle for Portland and Los Angeles. In 1921, Henry Benezra became the first Sephardic Jew to graduate from the University of Washington and six years later he was elected President of Sephardic Bikur Holim. That same year some Sephardic Bikur Holim members left when the Marmara group announced plans to build their own synagogue, the Ahavath Ahim, which was completed in 1922. In 1921 Rabbi Haim Nahum, former Haham Bashi (Chief Rabbi of Turkey) visited Seattle on behalf of the Alliance Israelite Universalle to raise money. The entire Sephardic community turned out to see and hear Rabbi Nahum who remained in Seattle for three weeks. He raised more money in Seattle than he did in Portland or Los Angeles. In 1924 a very significant event occurred within the Sephardic Bikur Holim community. Since Rabbi Abraham Maimon had been the rabbi in Tekirdag when many of the members had lived there prior to immigrating to the US, they knew him and greatly respected and admired him. When some of these leaders learned that he might be interested in moving to Seattle, they began contacting him by mail in late 1923, and by mid-1924 the papers and preparations for his appointment as rabbi and his move to the US were completed. This took some time because beginning in 1921 the American Congress passed several laws restricting immigration to the US. Rabbi Maimon and his family (his wife Vida and 6 of his 8 children) arrived in September, 1924, in the evening, a day before the start of Yom Kippur. Due to illness the family had to spend Rosh Hashanah on Ellis Island before proceeding by train to Seattle, where they were warmly greeted by more than 100 members of the community. During the 1920s one of the unique social past times for the members of SBH was attending the amateur Sephardic Theater, performances of plays completely in Ladino. Leon Behar, who grew up in Istanbul before coming to Seattle, was the most accomplished producer of Ladino theatrical productions, but not the only one. In Istanbul as a teenager he had participated as an actor, director and playwright of several plays, and he put that talent to good use in Seattle. He produced and directed a number of plays, beginning with Dreyfus in 1922, using talented Sephardim from all three synagogues as his actors. Once the Depression started at the end of 1929, the era of Ladino dramatic productions in Seattle came to an end. By 1930, Seattle would be second to New York in Sephardic population in the United States. Rabbi Maimon died in 1931 and Rabbi Isaac Azose was called to lead the congregation again. In 1944, Solomon Maimon, son of Rabbi Abraham Maimon, became the first American Sephardic Jew to receive rabbinic ordination in this country. He was the first Sephardi to receive semiha at Yeshiva University and in the country. He remained the rabbi of Sephardi Bikur Holim for 40 years. After him more than 30 SBH members followed in his footsteps, going to New York to further their Jewish education by attending YU, either its Yeshiva College (for men) or Stern College (for women). Along with Bikur Holim’s Rabbi Wohlgelernter, he was instrumental in organizing the first all day religious school in Seattle, Seattle Hebrew Academy. Rev. Morris Scharhon, the Hazzan, passed away in 1950, and the synagogue began looking for a new Hazzan Rev. Samuel Benaroya, originally from Edirne, Turkey was at the time the Hazzan of the Sephardic kehilla in Geneva, Switzerland. At the request of the Sephardic Bikur Holim Congregation, another Turkish citizen, Rev. Samuel Benaroya (d. 2003) and his family immigrated to Seattle in 1952. Reverend Samuel Benaroya is a descendant of one of the most renowned families of musicians from Edirne, Turkey, where he was born in 1908, the youngest of five brothers and two sisters. His father, Haham Yitzhak Benaroya, was a Hazzan in Edirne for 60 years. In early 1935 the three social organizations merged into the Seattle Sephardic Brotherhood, which became the largest Sephardic organization in Seattle, and still plays an important role today. Reverend Samuel Benaroya had served the synagogue for 26 years as Hazzan, since his arrival in 1952 from Geneva, Switzerland. He was highly regarded in the community for his abilities as Hazzan, his knowledge and interpretation of the Turkish traditional melodies and for his friendliness and helpfulness in the community. In 1965, a new synagogue was purchased by SBH at 6500, 52nd Avenue South in Seward Park and by 1975, the SBH constitution was amended to allow for women to serve as members of Board of Directors; two women, Becky Varon and Judy Balint, were elected the following year. By the end of 1977 the Reverend informed the synagogue board of his intention of retiring as Hazzan by the middle of 1978. Rev. Samuel Benaroya passed away in Seattle, Washington on Thanksgiving Day 2003 at the age of 95. In 1977, Dr. David Raphael, who came to Seattle and became affiliated with SBH in the late 1960s along with his wife of Turkish descent, Esther, directed and produced the famous film, ‘Song of the Sephardi’, telling the cultural tale of the Sephardic Jews. 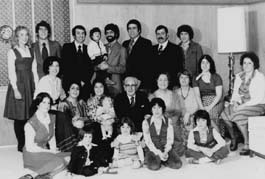 By the 1980s, the Seattle chapter of the umbrella organization ‘American Sephardi Federation’, established in 1973, was created, holding regular conventions which have included such noteworthy speakers and attendees as CNN correspondent Wolf Blitzer. In the 1990s, Sephardic Bikur Holim was led by Rabbi Simon Benzaquen, who was born and raised in Spain, and educated and rabbinically ordained in England. According to Stacey Schultz, freelance writer living in Seattle, today, there are over 40,000 Jews in Seattle—the Sefardic community is now the third largest in the country—and most live in small clusters throughout the city and suburbs. WHAT DID THE FIRST IMMIGRANTS IN SEATTLE DO? One of first Turkish Jewish immigrants, Solomon Calvo, founded the Waterfront Fish and Oyster Co. in Seattle, while Nessim Alhadeff started the Palace Fish and Oyster Co., which later became the Pacific Fish Co. In the 1920’s, Turkish immigrant David Levy purchased City Fish Market, which he ran until his death in 1943. His sons sold the business in 1995, but the store remains in the market. In 1951, Jack Amon bought the Pure Food Fish Market. His son, Sol, took over in 1956 and continues to run the Pike Place operation. In 1914, the Young Men's Sephardic Hebrew Association was founded to improve Turkish-Jewish conditions in Seattle. Parliamentary rules were followed for meetings. The group purchased a home on 14th Avenue between Washington and Yesler and converted it into a clubhouse with pool tables, a card room, library, and coffee shop. In 1917 the name changed to Young Men's Sephardic Association. In 1920 the hall moved to 109 12th Avenue. The Young Men's Sephardic Association was instrumental in achieving social harmony among the Sephardim. In 1935, the unique Sephardic culture possessed by some of the older members of the SBH community received recognition by a UW professor in the Anthropology Department, Dr. Mel Jacobs. Emma Adatto, a member of SBH along with her parents Anna and Nessim Adatto, was a student in the UW Anthropology Dept. writing a MS thesis on Sephardic folklore. The SBH Talmud Torah directed by Prof. Albert Levy December 1937. She sought to add an extra dimension to her thesis by including with it recordings of some of the old Sephardic songs, Ladino romanzas and Turkish songs. Thus a group of about 10 Sephardic women, most from SBH, was driven to the UW to record a series of Sephardic songs, and the best technology available at that time for recording music was the old-style large metal cylinders. In 1981, through the intervention of a latter-day Jewish music expert, these recordings were transferred to audiocassettes. Sources: Albert Adatto, "Sephardim and the Seattle Sephardic Community", MS Thesis, U. of Washington, 1939 / Isaac Maimon, "The History of Sephardic Bikur Holim Congregation, 1914-1989", 1989 / Joy Maimon, "Unity and Divisions Among the Early Seattle Sephardic Community" Senior Paper, U. of Washington / Marc Angel, "The Sephardic Theater of Seattle Jewry," Western States Jewish History, October, 1996, Vol. XXIX, No. 1, p. 553 / Isaac Maimon, English Translation of the Minutes of the Bikur Holim Building Committee, 1928-1930.